Police in Niagara Falls say they have identified three of four people involved in a video that appeared online showing a physically and mentally disabled man being slapped. The video was posted to Facebook and shows the man, who authorities have identified as a man named "Billy," being struck. Police officers know Billy, who say they see him walking up and down Pine Avenue every day. Police say for the most part, Billy keeps to himself and bothers no one. Police in Niagara Falls say they have identified the man seen slapping video, two women off camera and they believe they have identified the person filming the incident. Officers met with the District Attorney's Office Monday afternoon and will be presenting evidence to a grand jury in the hopes of a felony indictment. Authorities say two charges apply. Kelly J Rizzo, Chief of Detectives in Niagara Falls, said, "We have received over a hundred calls with information about the video which shows the concern our citizens have for victims like Billy. For members of the NFPD that is the silver lining to this grotesque incident." Rizzo is calling for those three people already identified to turn themselves in. "Turning themselves in is the only chance they have to mitigate what they have already done. Members of the DA's office are equally appalled and working hand in hand with us to bring forth a successful prosecution." Billy is not homeless, according to police, but they say he suffers both physical and mental disabilities and they believe "he was targeted due to his limited ability to communicate clearly with responding officers when police are called." Though the police were not called to this incident, they say Billy has been victimized several times in the past. 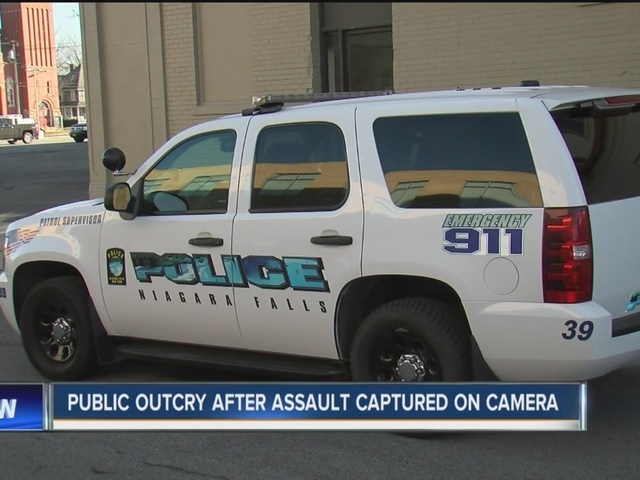 In a statement, Niagara Falls Police say they are "disgusted by what is shown on the video." Detectives were shown the video around 7 a.m. Friday and have been working on the case since that time. They are asking anyone who witnessed the incident at the Tops on Portage Road to come forward. Billy has already been interviewed. Niagara Falls Police say they "look forward to bringing those responsible before a judge to answer" for hitting Billy. "It will be a pleasure to play this video in a courtroom. I am sure others will see, as I do, that Billy's mental capacity is far greater than the two perpetrators," said Rizzo. Many people who live and work on Pine Avenue are familiar with Billy and are furious with what happened. "It is pretty pathetic. Billy is harmless and to film something, chuckle while they are filming it, tell the guy to hit him again, I think that is just incomprehensible," said James Fernandez, president of George Optical. Fernandez said he often sees Billy and keeps a watchful eye on him to make sure he is doing alright. "No human being should be treated like that," said Billy's friend Minnie Williams. "If I had seen them hurting Billy like that, I would have stepped up and slapped the guy around to see how he liked it," said former US Marine Steve Flagg.